If your “get up and go” seems to have “got up and went,” we encourage you to kick start a brand new you. Get started now with pHountain’s Starter Kit! For first-time customers, pHountain is offering a one-time starter kit to help you get acquainted with our company and our phenominal products! You’ll feel great and wonder why it took you so long to get started! 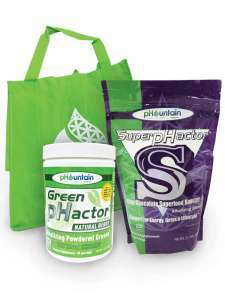 Our Starter Kit includes two of pHountain’s best-sellers Green pHactor and Super pHactor plus a tote bag for $79 ($118 retail value)! Plus, you’ll enjoy FREE Shipping!